The sewing pattern scene for tweens and teens isn't as broad as some of the other size ranges, so we get pretty excited with every Modkid pattern that is released with juniors sizing. When the style is as on trend as the new Modkid Sierra Jumper pattern, it is sure to be a hit with this crowd. The initial photo inspiration we saw during the pattern development had only 4 buttons. According to Avery, six buttons made all the difference in the world. Her initial skepticism quickly dissipated as soon as she tried this on completely styled. She begged to wear it to church the next day! This is what excites me about sewing for my tween! I can customize the fit for my tall and slim girl, create modern styles while keeping them as modest as I like, and make her something no one else will be buying in the store. 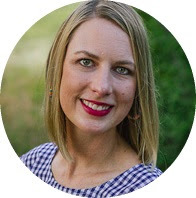 Have you checked out the Tween/Teen Modkid patterns lately? My rival college happens to have burnt orange as a school color. My dad has always insisted the use of the color is basically against family rules, so we are calling this a nice rust color and counting on that granddaughter charm to persuade him. 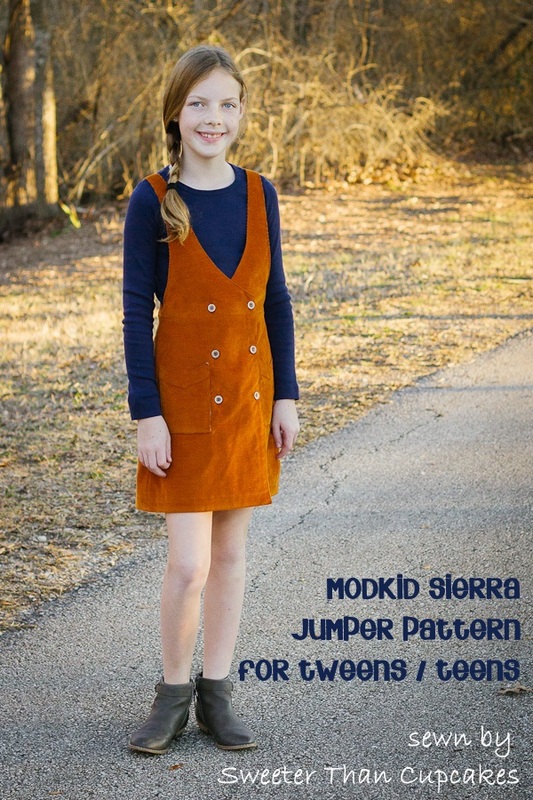 Bottomweight fabrics like corduroy, denim, and suiting are perfect for the Modkid Sierra. The patch pocket detail is one of those things you are convinced won't turn out as you are sewing, but after a good press it magically responds just as intended. The back rectangle rings and buttons/snaps on the Sierra Jumper make the length adjustable. The pattern includes instructions for additional buttons to accommodate growth too. Since we didn't have much room for growth anyway, I secured the buttons without a buttonhole. The crossover style makes for a unique wrap dress that provides style, coverage, and easy dressing. Be sure to join the Modkid Facebook Group for more inspiration on the Modkid Sierra Pattern. The testing group even included a teen that made her own jumper! Coupon code SIERRA40 gets 40% off your entire Modkid purchase. The code expires in 24 hours from the release time, so hurry!